If your lawn or property has bushes or hedges, you certainly understand how time consuming it can be to keep those bushes and hedges looking sharp and attractive. Without a doubt, the fastest way to trim and shape hedges is with an electric or gas powered hedge trimmer. With this tool, not only can you trim hedges down to an appropriate size in a short amount of time, you can also shape the hedges to look any way you want them to. A quality trimmer can be the difference between a consistently attractive yard, and a yard that looks perpetually overgrown. DeWalt has a reputation for making some of the top power tools on the market. The company manufactures everything from power saws, to drills, to hedge trimmers, and more. Their premier trimmer at the moment is the DEWALT DCHT860M1 40V MAX 4.0 Ah Lithium Ion Hedge Trimmer. Powered by battery to provide a clean and quick trim, this electric power tool is definitely one of the nicest residential trimmers you’re going to find. Let’s start by talking about its blade. It measures in at 22 inches long, and is double-sided. This allows you a great deal of reach, making it appropriate for any trimming task you might run into in a residential setting. Because it’s double-sided, you will be able to trim large amounts of hedges in a short amount of time, and with minimal effort. The blade’s teeth are spaced three fourths of an inch apart, allowing you to trim small to medium sized branches. The teeth are covered with a hooked tooth guard, ensuring that the blade will not harm you if it is to come into contact with your body. The DCHT860M is battery-powered, which will allow you to take it where ever you want, provided it is adequately charged. The battery is a 40v MAX 4.0 Ah Lithium Ion Battery which contains a charge indicator. This will allow you to know how charged the battery is at all times. The battery also comes with a charger so that you can charge it at any time. A fully charged battery will provide you with up to 70 minutes of constant work with the trimmer, giving you more than enough time to perform small trim jobs around the house. Housing the battery is a Xenoy cover that provides it with both supreme durability and protection. With a wrap around handle, this trimmer is very comfortable and easy to hold, regardless of what angle you have it pointed. This will allow you to withstand holding it for long periods of time. For safety purposes, it has a safety lock that makes it nearly impossible to start until you actually want to use it. You won’t have to worry about it accidentally injuring your kids or yourself. All in all, this tool weighs about 12 pounds, making it a little heavy, but very ergonomic and easy to carry around. Online reviewers love this hedge trimmer for its excellent battery power, with one reviewer stating he used it in lieu of a gas-powered one. He said it lasted over two hours with excellent power all the way through. Reviewers also give the DCHT860M credit for how quiet it is, stating that it is as powerful as a gas-powered trimmer, but not even close to as loud. Many reviewers complained of its weight, noting how difficult it was to lift it up for long periods of time. If you’re going to buy this trimmer, you might want to make sure that you’re capable of holding it up without becoming fatigued. All in all, the DEWALT DCHT860M1 40V MAX 4.0 Ah Lithium Ion Hedge Trimmer is as good of a battery-powered hedge cutter as you’re going to find. It’s very powerful, and has exceptional battery life that will allow you to work for hours at a time. 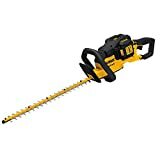 If you have a medium or large sized yard that requires a lot of hedge and branch trimming, the DEWALT DCHT860M1 40V MAX 4.0 Ah Lithium Ion Hedge Trimmer might be just the tool for you. Just make sure you’re strong enough to operate it. It goes for around $250.00 on most online retail sites. Echo is a company that’s responsible for making high quality power tools of all kinds. From chainsaws and hedge trimmers, to leaf blowers and lawnmowers, Echo is the manufacturer of some of the premier outdoor power tools on the market. Currently, their top trimmer is the Echo HC-152 Gas Powered Hedge Trimmer. With an ergonomic handle and an extremely powerful blade, this power tool can take on anything you throw at it. Measuring in at 20 inches, the HC-152’s blade has an excellent reach that is capable of trimming branches both close and far. Its double-sided blade will allow you to get the job done in half the time, allowing you to cut branches and hedges with the minimal amount of body movement required. Each tooth on the blade is spaced five eighths of an inch apart, allowing you to cut small to medium sized branches with great ease. The blade is described by the company as a RazorEdge blade because of the fact that it’s been laser cut to ensure ultimate sharpness and durability. You will be able to cut through any branch with consistency and ease for a long period of time. Making use of a 21.2 cc professional-grade, 2-stroke engine, this trimmer is powered by gas, making it very powerful, and allowing it to perform for longer periods of time than a battery-powered cutting tool is able to. The gas tank is translucent. This allows you to see how much gas you have left, and alerts you to when you need to add some more. A full tank of gas will last you well over 2 hours, and will typically provide you with even more time. Unlike with a battery-powered trimmer, you don’t have to wait for a battery to charge every time you want to use it. You can simply add more gas and get back to trimming. The front of the trimmer sports a hard and well-constructed support bar that allows for straighter and more consistent cuts. In front of this support bar is a safety shield that will protect your hands and ensure that no serious injuries can occur. A button must be pushed to make the blade run, so you won’t have to worry about being injured by a blade starting when you don’t want it to. All in all, the HC-152 weighs around 20 pounds, which is rather heavy. It does, however, possess a very ergonomic handle that provides you with great comfort and ease-of-use. Online reviewers laud this hedge trimmer for how easily it starts, stating that is has no problem running whether it’s in hot or cold weather. Reviewers also give it credit for its ability to cut through branches both big and small, with most reviewers stating that it tops out at branches that are about three fourths of an inch in diameter. Some reviewers complain of how heavy the HC-152 is, but if you’re going to use a gas-powered trimmer, it’s something you’re going to have to deal with. Some reviewers noted that their engine would sputter when its gas was getting low. At the end of the day, the Echo HC-152 Gas Powered Hedge Trimmer is a long-lasting, high-powered cutting tool that can brave any weather condition. With an ergonomic handle, and a razor sharp blade, it’s a monster of a hedge trimmer. If you’re looking for a gas-powered hedge cutter that can handle any yard size, the Echo HC-152 Gas Powered Hedge Trimmer is a product you should take a look at. It can be purchased for around $350.00 on most online retail sites. Black & Decker has always made high quality power tools of all kinds. One of their top power tools at the moment is the BLACK+DECKER LHT2436 24-Inch 40-Volt Cordless Hedge Trimmer . A battery-powered trimmer with a lot of reach, this LHT2436 is a great cutting tool for small and medium size yards. Its blade measures in at a staggering 24 inches, allowing it to reach any branch in its general vicinity. The blade is double-sided, giving it the power to cut total trimming time in half, and allowing you to relax as much as possible while doing so. The teeth on the blade are three fourths of an inch apart, allowing you to cut both small and medium sized branches with quickness and ease. Durable and resistant to rust, the dual-action blade also helps to minimize the overall vibration given off by the trimmer. The LHT2436 is battery-powered. A 40-volt lithium ion rechargeable battery will give you around 3 hours of total cutting time each time it is fully charged. This results in a maximum of 6,000 acres trimmed if you work as efficiently as possible. 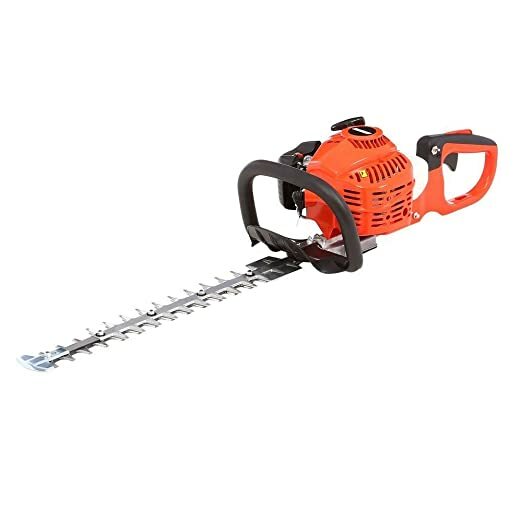 If you have a small to medium sized yard, this hedge trimmer would be perfectly suitable for getting the job done. This battery takes around an hour to charge fully, and, once it is charged, can last a very long time if it is not used. As far as battery-powered hedge trimmers go, this one is phenomenal. A very ergonomic front handle provides this cutting with excellent stability, ensuring quick, easy, and consistent cuts. A safety guard also resides in front of this handle. This will keep your hand from slipping toward the blade, reducing the chance of serious injuries, and keeping you safer overall. Weighing in at just 6.9 pounds, the LHT2436 is very easy to hold up and carry around. No matter your size and strength, this trimmer will be very easy to use. Online reviewers love the LHT2436 for how light it is, stating that it’s very possible for them to hold it with just one hand when they’re reaching for far away spots. Reviewers also give it credit for its battery quality, stating that it charges quickly and holds up for the entirety of their trimming process . Some online reviewers complained about this trimmer’s cutting quality, stating that it had to “gnaw” through branches that were half an inch in diameter. It would only cut branches cleanly if they were under a half inch. Some reviewers also had trouble with their batteries burning out prematurely. Though it may not be as powerful as some battery-powered cutting tools, this trimmer makes up for it with its very light weight and ease-of-use. Unlike many of the heavier models, the BLACK+DECKER LHT2436 24-Inch 40-Volt Cordless Hedge Trimmer is suitable for users of all sizes and strength levels. 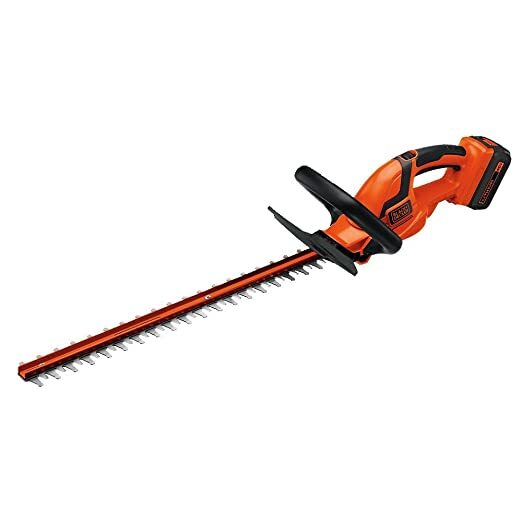 If you have a medium sized yard with lots of trees or bushes, the BLACK+DECKER LHT2436 24-Inch 40-Volt Cordless Hedge Trimmer is the perfect tool to keep those trees and bushes in line. It can be purchased for around $100.00 on most online retail sites. Whether you enjoy landscaping or not, you need to keep your trees and hedges from becoming overgrown. If you’re just looking for a branch-cutting tool that’s passable, you probably don’t want to spend a bunch of money on it. Luckily, there are a number of hedge trimmers out there that will do a great job for a very affordable price. One of these is the Remington RM5124TH Dual Action 5 Amp 24-Inch Electric Hedge Trimmer. A 24 inch blade provides the RM5124TH with excellent reach, allowing you to cut branches that are far out of arm’s length. The blade is titanium-coated, giving it maximum durability and cutting power, and providing you with the ability to cut through any branch you see up to three fourths of an inch. Unlike the other trimmer’s on this list, the RM5124TH is corded. This will limit the amount of places on which you can use it, but with an extension cord, you can still reach most of the areas you need. It is driven by a 5-amp electric motor, providing you with easily enough power to get through branches both thick and thin. Of course, because this trimmer is corded, you will be able to use it for as long as you have to use it. There’s no limit to the duration of its power. With an ergonomic and cushioned back and front grip, this trimmer is very easy to hold up and carry around. It weighs in at around 10 pounds, making it very light and easy to handle. When it’s in use, your front hand will be protected by a safety shield that prevents it from slipping onto the blade. This will greatly reduce the chance of injury. Online reviewers laud the RM5124TH for how well it cuts through branches, stating that it only runs into problems with very large pieces of wood. Reviewers also give it credit for the length of its blade, noting that it can reach high up into trees and cut with no problem. Some reviewers find this trimmer to be a bit on the heavy side, but they also realize that its heavy weight is necessary to supply the power that it has. Some reviewers complained about how the blade would shut off when they took their hand off the handle, but this is a very common safety feature in many power tools. For just $70.00 on most online retail sites, the Remington RM5124TH Dual Action 5 Amp 24-Inch Electric Hedge Trimmer is a great deal. Its heavy-duty engine and premier cutting power make it a truly excellent cutting tool for its price. If you’re looking for something cheap to trim branches with every once in a while, the Remington RM5124TH Dual Action 5 Amp 24-Inch Electric Hedge Trimmer is definitely a product you should check out. Hedge trimmers are generally fueled in one of two ways. Some are fueled by gasoline, while others are fueled by electricity. Each different fuel offers different benefits and different complications. Gas-powered tools are typically more powerful than electric ones, making them better for large trimming jobs that take a great deal of time. However, they’re also heavier than electric tools, which might not be as powerful, but are easier to handle overall. Though, a big positive when it comes to gas-powered trimmers is that they are suitable for any type of weather. Because they don’t make use of electricity, there’s is no need to worry about getting shocked when exposed to rain. Electric cutting tools come in both corded and cordless styles. The corded style is not as portable as the cordless and gas-powered ones, but it does provide more power than a cordless ones. In general, gas-powered trimmers are most appropriate for large jobs in large yards, cordless ones are most appropriate for small tasks in small yards, and corded ones are most appropriate for small to medium tasks in small to medium yards. You should consider what exactly you’ll be using the tool for before making your purchase, and then choose accordingly. A big thing to consider when purchasing a hedge trimmer is the blade type. Blades typically range anywhere between 14 inches and 40 inches. If you’re just looking to do small jobs around the house in which everything in well within reach, you shouldn’t need anything more than a 14 inch blade. But, if you’re doing a great deal of work, a 40 inch blade will certainly help you get your work done faster. A blade on a hedge trimmer is a flat piece of metal that is lined with what are called blade teeth. These teeth do the cutting. The space between each tooth will determine the size of branch that the tool is capable of cutting. Commercial cutting tools will usually have a tooth gap of more than 1 inch while residential trimmers will typically have a tooth gap of around a half inch, or three-fourths of an inch. Each blade comes in one of two styles. These styles are single-sided blades and double-sided blades. Single-sided blades are typically more safe because you can see exactly what the blade is coming into contact with at all times. However, double-sided blades are more common, and are also more efficient than single-sided blades. They are able to use both sizes to trim hedges, and so all you have to do is move the blade back and forth while the motor is running. You should choose your blade style based on what your comfortable with, and based on what you intend to use it for. Smaller blades are better suited for small tasks, while larger blades are better suited for large tasks. As with any power tool, safety is the #1 priority. These tools can be very dangerous when not used appropriately, and you want to take all of the precautions available to you before you begin to use them. There are several safety features that you can look for in a hedge trimmer. One of these features is tooth extensions. These are pieces of metal that extend out further than the teeth on the blade, ensuring that the teeth will not be able to make contact with your body. Some trimmers have power buttons that will only allow them to run when they are engaged. The second you take your finger off the button, the power will turn off. Front-handle shields are available on many hedge trimmers. These shields quite simply protect your front hand from coming into contact with the blade when it’s moving. A lock might also be a good option. This lock will allow you to keep the trimmer from being turned on by children when it’s in storage. Ideally, you would find a branch cutting tool with as many safety features possible. You can never be too safe. Hedge trimmers come with a bevy of special features. Some gas-powered ones have translucent fuel tanks that allow you to see how much gas they have left in them. Many have a wrap around handle that provides you with a more comfortable grip overall. Some also have a lock on feature that allows you to keep the blade running even when your finger is not holding the power button down. This would be very helpful in jobs that take a great deal of time as you would not have to fatigue your hand to keep the blade running. It’s important to look at blade strength when making a decision about which hedge trimmer to buy. Blades made of high carbon steel not only last longer. They also cut easier and can be sharpened to ensure the cut is always of the highest quality. Each special feature helps to make the tool more valuable, which, in turn, makes your job easier. Landscaping is an activity that requires consistent care and a great deal of attention. Between lawn mowing, weed pulling, and hedge trimming, it can take up a great deal of your time. To make the most of your time, it’s important to have tools that can leave your yard looking beautiful in the most efficient manner possible. A quality hedge trimmer may be just what you need to keep your yard in order. But remember that an electric or gas powered tool can be dangerous. You’re purchasing a sharp cutting tool. Safety should be your number one priority. After you have considered safety, you can make a purchase based on the trimmer’s many other features and aspects.